Hansen Protection have a lot of their manufacturing in Norway, where considerable expertise has been built up in textiles and with experienced people. The company is ISO 9001 and 14001 certified, and manufacturing is carried out in accordance with demanding civil aviation standards. Components used in production are tested in our laboratory to make sure they meet our quality requirements. Finished suits are subjected to stringent testing and extensive checks before they are sent to customers. Hansen Protection AS has more than 100 years experience manufacturing to meet the most stringent quality demnds. In connection with our ISO 9001:2008 certification our basic philosophy is one of continuous improvement. Our internal focus is on interactively identifying areas for improvement in our processes and with our people. As well as ISO 9001:2008 Hansen Protection has a number of other certificates and qualifications. 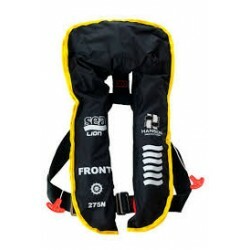 SeaLion inflatable lifejackets help turn an unconscious person over to a correct floating position with the head well above water.